Will South Brooklyn Be the Next Fashion Capital? NEW YORK—Southern Brooklyn will soon be home to a new fashion Manufacturing Innovation Hub where every aspect of the fashion industry can coexist in one 160,000-square-foot space. The grand vision came from ManufactureNY CEO Bob Bland, a ten-year veteran of the New York fashion industry who started working in the city at an atelier right off Bryant Park. Over the years, she saw talented designer after designer leave New York due to high costs and real estate interests infringing on the manufacturing space available in Midtown’s Garment District. She held out for some kind of solution, but nothing came. So in 2012 she launched the pilot ManufactureNY space in Midtown, a tiny 2,000-square-foot facility where nearly 400 designers have made use of the space to work and launch their lines. But that was just the first step for Bland, who had a 20-year project in mind. She set out to find some space in the city big enough to house every aspect of the fashion industry—from wearable tech design to apparel manufacturing and everything in between—so there might be a sanctuary for emerging designers and fashion entrepreneurs in the city. 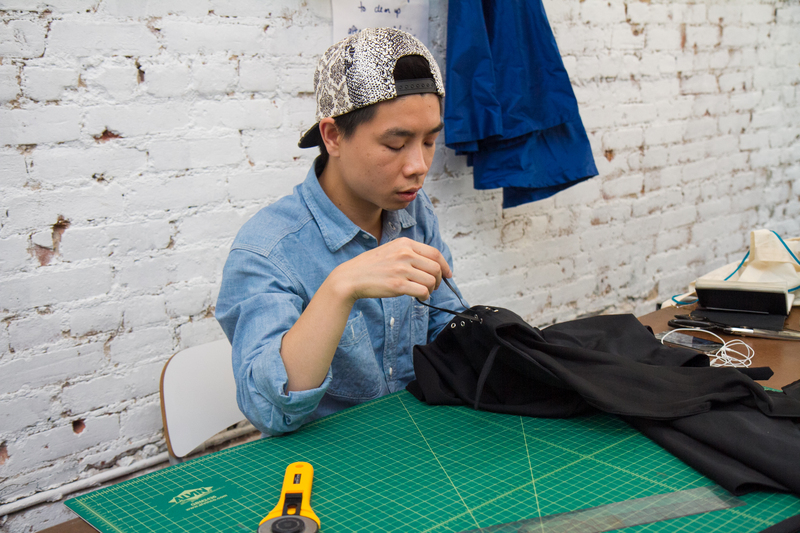 Local manufacturing is crucial to the fashion industry, a $98 billion industry in New York, and that is something that requires space. Eventually, Bland found that space in Sunset Park. Located at the Liberty View Industrial Plaza, the hub spans the entire length of a city block and has the biggest single floor space left in the entire city. Sunset Park is filled with creative energy, Bland said, and her goal is to create nearly 300 jobs. About a third of the city’s manufacturing jobs are in the fashion industry, and they are high-skill and high-wage jobs. 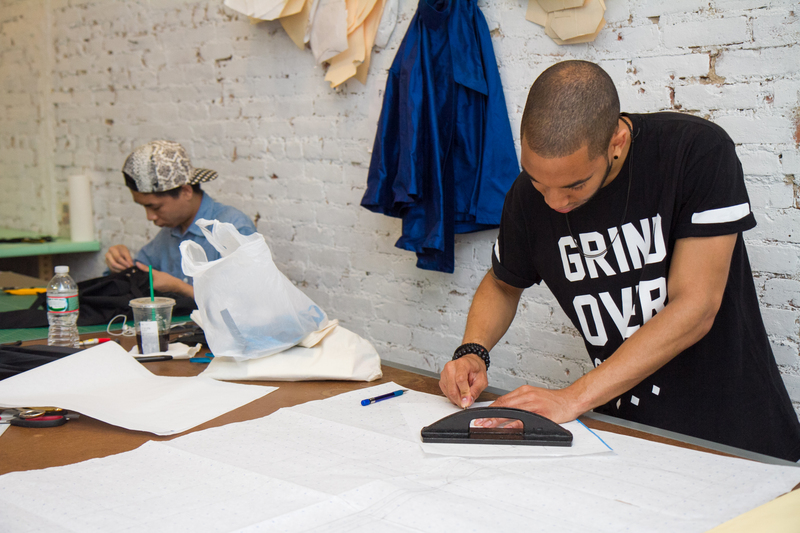 From the very beginning, community outreach was a core part of ManufactureNY’s strategy. There will be training, workforce development programs, and public tours once the facility is in action. When the hub is open, it will include a workforce development center, a research and development center for tech wearables, a small-run factory specializing in sample making, a design accelerator to help emerging talent, an incubator space with 12 studios, work areas for 50 designers, and other spaces and equipment. “[Bob Bland] is a force of nature,” Glen said to a room full of local officials, designers, and manufacturers. The hub is a result of Bland’s tireless effort, officials said, and she has won them over. “We can create a better future for New York City, said Bland on Thursday. In addition to the $3.5 million invested through the Economic Development Corporation (NYCEDC), a total of $8 million will be available for future allocations that have yet to be determined. Earlier this year the project also won a federal grant for its work on revitalizing the manufacturing industry. “I am tremendously inspired … by her vision and perseverance, pulling together a brand new experience in this space, working together with government to convince us of the idea,” said Kyle Kimball, NYCEDC president. Between Liberty View and the neighboring industrial park Industry City, there is 7 million square feet of space officials hope to use to grow the fashion industry. The Liberty View Industrial Plaza was built by the federal government in 1916. It was recently renovated by Salmar Properties at a cost of almost $100 million. The 8-story, 1.1 million square-foot building was outfitted for light or heavy manufacturing. “Our vision is to promote job creation in New York and to develop Liberty View as the new hub for the City’s fashion industry that is being squeezed out of Manhattan by high rents and lack of space,” said Salmar Properties co-founder Marvin Schein. The building is located in the Southwest Brooklyn Industrial Business Zone, an area designated for industrial use. In recent years, the innovative area has gained attention for its artisan foods. Industry City, a 6-million square foot manufacturing district right next to Liberty View, showcases several of these kinds of companies at its food hall. Not too far from that, Pratt Institute recently launched its Brooklyn Fashion and Design Accelerator at the former Pfizer building in South Williamsburg. Debera Johnson founded the space as a way to help grow sustainable local businesses. The Accelerator includes a small-run production facility, a rapid prototyping center, and a textile technology lab. The new administration has expressed great interest in revitalizing the manufacturing sector. City Council recently released a report to use zoning to create three new kinds of districts in order to grow a similar type of innovation hub: industrial employment districts, creative economy districts, and real mixed-use zones. The city was once the center of industrial activity, then jobs bled out by the thousands decades ago. But in 2010, the number stabilized, and certain areas of manufacturing have since seen an uptick. Manufacturing and industrial jobs currently account for 10 percent of the city’s private workforce. Reports attribute the uptick to the rise of entrepreneurs in the city opening creative start-ups incorporating tech, food manufacturing, and increased interest in the local production of goods. But a lack of affordable space has been prohibitive, and areas zoned for manufacturing allow for competing uses under current codes. The manufacturing zones created in the 1960s are no longer productive, according to the report, and it is time to rewrite some of the city’s zoning codes. NEW YORK—"You need art to stay whole as a person,” said 22-year-old Jai Raphael, a rapper who performed on Monday in the Brooklyn Botanic Garden.